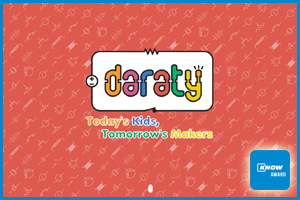 Daraty is a self-learning hardware toolkit designed to teach children 7 to 12 the principles of electronics. The kit connects to a mobile app which includes child-friendly scientific content and interactive quizzes. Daraty comes in two editions: an organizational one designed for schools and an individual one. The app guides young users in circuit design by detecting and correcting errors, allowing them to build original tech projects solving everyday problems, with a profile for each user to track their progress and share new circuits with the Daraty online network. The app supports multiple languages with a current focus on Arabic. Using edutainment, Daraty develops interactive and enjoyable teaching methods starting with electronics, later other fields such as physics and chemistry. Teaching electronics not only provides children with an understanding of circuits and computers, but also improves logical thinking and problem-solving skills, while preparing them to be active in a world where electronic skills are more and more in demand. 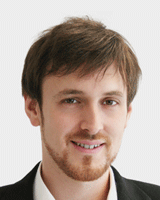 “A part of my duty is taking care of a student lab at the Institute Systems and Datascience (ISDS), where we prototype simple hardware, and use data analytics to come to novel and intelligent new interactions and user interfaces. Our focus in on the analytics and software, so most of the people do not have an electro-engineering background. I see that having some literacy with electronics is becoming more and more important, with respect of the bobbyist movement, home automation and IoT. Having a good patch from childhood to adulthood to being able to work with electronics has tremendous impact. The simplicity of Daraty, the similarity to later real prototype environments, but especially the promise to let children play unsupervised with it and learn and explore on their own fascinated me.